Be Prepared to improvise and use what you have on hand to make it on your own for at least 3 days, maybe longer. While there are many things that might make you more comfortable, think first about fresh water, food and clear air. Include Medications & Medical Supplies If you take medicine or use a medical treatment on a daily basis, be sure you have what you need on hand to make it on your own for at least a week and keep a copy of your prescriptions as well as dosage or treatment information. If it is not possible to have a week-long supply of medicines and supplies, keep as much as possible on hand and talk to your pharmacist or doctor about what else you should do to prepare. If you undergo routine treatments administered by a clinic or hospital or if you receive regular services such as home health care, treatment or transportation, talk to your service provider about their emergency plans. Work with them to identify back-up service providers within your area and other areas you might evacuate to. Include Emergency Documents Include copies of important documents in your emergency supply kits such as family records, medical records, wills, deeds, social security number, charge and bank accounts information and tax records. It is best to keep these documents in a waterproof container. If there is any information related to operating equipment or life-saving devices that you rely on, include those in your emergency kit as well. 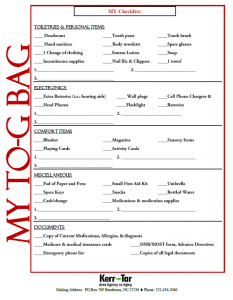 If you have a communication disability, make sure your emergency information list notes the best way to communicate with you. Also be sure you have cash or travelers checks in your kits in case you need to purchase supplies. Additional Items: If you use eyeglass, hearing aids and hearing aid batteries, wheelchair batteries or oxygen, be sure you always have extras in your kit. Also have copies of your medical insurance, Medicare and Medicaid cards readily available. If you have a service animal, be sure to include food, water, collar with ID tag, medical records and other emergency pet supplies. The reality of a disaster situation is that you will likely not have access to everyday conveniences. To plan in advance, think through the details of your everyday life. Develop a Family Emergency Plan: Your family may not be together when disaster strikes, so plan how you will contact one another and review what you will do in different situations. 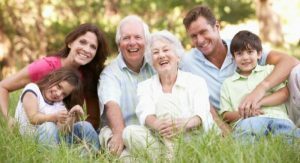 Consider a plan where each family member calls, or e-mails, the same friend or relative in the event of an emergency. It may be easier to make a long-distance phone call than to call across town, so an out-of-town contact may be in a better position to communicate among separated family members. Depending on your circumstances and the nature of the attack, the first important decision is whether you stay put or get away. You should understand and plan for both possibilities. Watch television and listen to the radio for official instructions as they become available. Create a Personal Support Network: If you anticipate needing assistance during a disaster, ask family, friends and others to be part of your plan. Share each aspect of your emergency plan with everyone in your group, including a friend or relative in another area who would not be impacted by the same emergency who can help if necessary. Include the names and numbers of everyone in your personal support network, as well as your medical providers in your emergency supply kit. Make sure that someone in your personal support network has an extra key to your home and knows where you keep your emergency supplies. If you use a wheelchair or other medical equipment, show friends how to use these devices so they can move you if necessary and teach them how to use any lifesaving equipment or administer medicine in case of an emergency. Practice your plan with those who have agreed to be part of your personal support network. Create a Plan to Shelter-in-Place: There are circumstances when staying put and creating a barrier between yourself and potentially contaminated air outside, a process known as sheltering-in-place and sealing the room can be a matter of survival. If you see large amounts of debris in the air, or if local authorities say the air is badly contaminated, you may want to shelter-in-place and seal the room. Consider precutting plastic sheeting to seal windows, doors and air vents. Each piece should be several inches larger than the space you want to cover so that you can duct tape it flat against the wall. Label each piece with the location of where it fits. Immediately turn off air conditioning, forced air heating systems, exhaust fans and clothes dryers. Take your emergency supplies and go into the room you have designated. Seal all windows, doors and vents. Understand that sealing the room is a temporary measure to create a barrier between you and contaminated air. 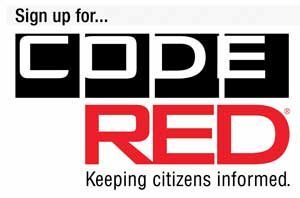 Listen to the radio for instructions from local emergency management officials. Create a Plan to Get Away: Plan in advance how you will assemble your family and anticipate where you will go. Choose several destinations in different directions so you have options in an emergency. Become familiar with alternate routes as well as other means of transportation out of your area. If you do not have a car, plan how you will leave if you have to. If you typically rely on elevators, have a back-up plan in case they are not working. Talk to your neighbors about how you can work together. Consider Your Pets: Whether you decide to stay put or evacuate, you will need to make plans in advance for your service animal and pets. Keep in mind that what’s best for you is typically what’s best for your animals. If you must evacuate, take your pets with you, if possible. However, if you are going to a public shelter, make sure that they allow pets. Some only allow service animals. Fire Safety: Plan two ways out of every room in case of fire. Contact Your Local Emergency Information Management Office: Some local emergency management offices maintain registers of older people so they can be located and assisted quickly in a disaster. Contact your local emergency management agency to see if these services exist where you live or visit ready.gov to find links to government offices in your area. 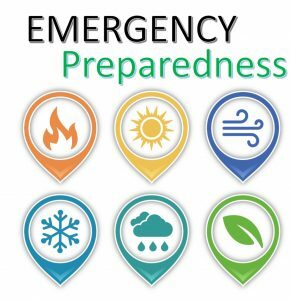 Some of the things you can do to prepare for the unexpected, such as assembling an emergency supply kit and making an emergency plan are the same regardless of the type of emergency. However, it’s important to stay informed about what might happen and know what types of emergencies are likely to affect your region. Be prepared to adapt this information to your personal circumstances and make every effort to follow instructions received from authorities on the scene. Above all, stay calm, be patient and think before you act.